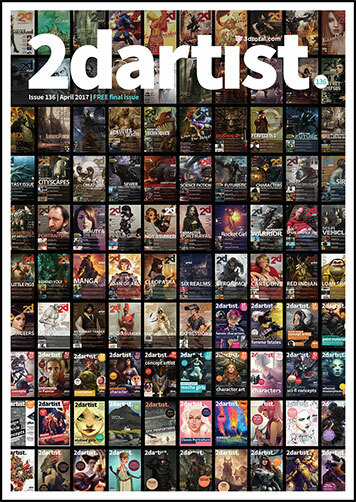 2dartist is a monthly downloadable PDF magazine produced for 2D digital artists of all levels. Whether you’re just starting out or you are already working as a 2D artist, each issue offers a range of tutorials, interviews, and inspiring images to leave you informed and motivated. In addition to providing you with an insight into the latest industry tips and trends, you can download this monthly magazine onto your computer, and also transfer it to your phone or tablet for easy, portable access to a wealth of creative inspiration and experience. 2dartist editor, Annie, brings you something awesome to look at every day, whether it’s an exciting new artist we’ve come across or the latest piece from one of the artists we regularly follow. We’d love to hear your thoughts on these so “Like” the page and leave your comments under the posts! Joe joined 3dtotal full-time in 2016 having previously supported the design team through busy periods. Among many other projects he works on the monthly digital art magazine 2dartist, although Joe's primary responsibility is as office quizmaster. Joe is also contractually obliged to provide his colleagues with monthly instalments of banoffee pie, a role he greatly enjoys. Annie comes from an arts background and studied contemporary fine art and literature at university. She spent time travelling and exploring different roles in the arts industry before taking an English Literature MA. Having joined 3dtotal in 2015, Annie enjoys working with some amazing artists and finding new talent for 2dartist magazine. Melanie comes from a publishing background and has previously worked for academic and educational publishers. Having always had a strong interest in art, she is now very pleased to be working for 3dtotal. Melanie enjoys skiing, Burrito Thursdays, and trying to exercise enough to justify Burrito Thursdays. Adam joined the staff at 3dtotal in August 2013, bringing with him writing and editing experience, as well as the will to help customers. He is constantly amazed by the creativity of others and loves the written word, but is becoming increasingly impressed with the CG 2D and 3D artwork out there! Thank you for visiting and we welcome your continued support in the future. All products and websites created/published by 3dtotal.com Ltd including www.3dtotal.com, www.3dcreativemag.com, www.2dartistmag.com all physical books, ebooks, emags, video content, texture libraries and any future releases may not be reproduced in any form or by any means, without the prior written consent of the publisher.